Our Geometric Fun business card design template shapes up your brand image with an attention-getting two-toned geometric pattern prominently featured front-and-back. A departure from old-school use of geometric shapes in design, Geometric Fun embraces a touch of minimalism with plenty of white space to help your brand stand out. Your name and contact information go on the front, and you can upload your logo on the back. Choose between three color options (shades of blue, green, and red/orange) and four different edge finishes. 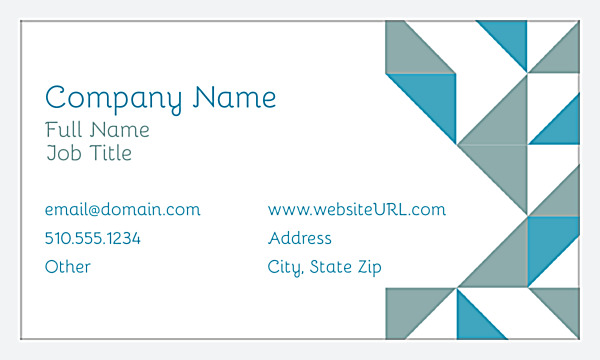 Available in both horizontal and vertical layouts, Geometric Fun is an excellent business card design choice. Customize Geometric Fun to match your band today! Our online design tool is the fastest and easiest way to personalize Geometric Fun and make it your own. Choose your layout (horizontal or vertical) and color scheme, then follow the on-screen prompts to customize your company name, name, and contact information. 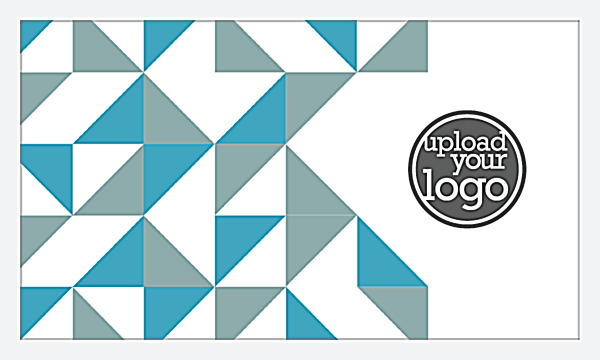 Upload your own logo to add to the back, then review your design before you print custom business cards. You can even download a free PDF to share! When you choose PsPrint as your custom business card printing partner you can expect the same fast turnaround and reliability thousands of others have come to rely on every day. Your business cards will be printed on the best paper stocks and high-quality, vibrant soy inks; plus, every business card printing job is backed by our 100% customer satisfaction guarantee! Seeking even more custom options? Enhance your business card design with custom foil stamps or die-cut shapes and cut-outs. Our custom printing team is on-hand to make it happen! And don’t forget to print matching brand collateral including letterhead, envelopes, brochures, and more.